2017-05-31 10:05:25:211 Error DReplay Unexpected error occurred! Critical Error: code=[c8503012], msg=Unexpected error occurred! Security violation with invalid remote caller. None of these errors help to pinpoint the cause of the problems, all of which are security/permissions related from what I’ve run into so far, but it’s not easy to figure it out unless you already know a fair bit about Distributed Replay and how it SHOULD be configured so you can spot where problems might be and try making changes. 2017-05-31 11:05:29:669 OPERATIONAL [Controller Service] Microsoft SQL Server Distributed Replay Controller – 13.0.1601.5. 2017-05-31 11:05:29:669 OPERATIONAL [Controller Service] © Microsoft Corporation. 2017-05-31 11:05:29:669 OPERATIONAL [Controller Service] All rights reserved. 2017-05-31 11:05:29:684 OPERATIONAL [Controller Service] Current edition is: [Enterprise Edition]. 2017-05-31 11:05:29:684 OPERATIONAL [Controller Service] The number of maximum supported client is 16. 2017-05-31 11:05:29:684 OPERATIONAL [Controller Service] Windows service “Microsoft SQL Server Distributed Replay Controller” has started under service account “NT SERVICE\SQL Server Distributed Replay Controller”. Process ID is 6572. 2017-05-31 11:05:29:684 OPERATIONAL [Controller Service] Time Zone: Eastern Standard Time. 2017-05-31 11:05:29:684 OPERATIONAL [Common] Initializing dump support. 2017-05-31 11:12:16:672 OPERATIONAL [Client Service] Microsoft SQL Server Distributed Replay Client – 13.0.1601.5. 2017-05-31 11:12:16:672 OPERATIONAL [Client Service] © Microsoft Corporation. 2017-05-31 11:12:16:672 OPERATIONAL [Client Service] All rights reserved. 2017-05-31 11:12:16:672 OPERATIONAL [Client Service] Current edition is: [Enterprise Edition]. 2017-05-31 11:12:16:672 OPERATIONAL [Common] Initializing dump support. 2017-05-31 11:12:16:672 OPERATIONAL [Client Service] Windows service “Microsoft SQL Server Distributed Replay Client” has started under service account “NT SERVICE\SQL Server Distributed Replay Client”. Process ID is 7008. 2017-05-31 11:12:16:672 OPERATIONAL [Client Service] Time Zone: Eastern Standard Time. 2017-05-31 11:12:16:688 OPERATIONAL [Client Service] Controller name is “SQL2K16-AG01”. 2017-05-31 11:12:16:688 OPERATIONAL [Client Service] Working directory is “C:\Program Files (x86)\Microsoft SQL Server\130\Tools\DReplayClient\WorkingDir”. 2017-05-31 11:12:16:688 OPERATIONAL [Client Service] Result directory is “C:\Program Files (x86)\Microsoft SQL Server\130\Tools\DReplayClient\ResultDir”. 2017-05-31 11:14:24:467 Error DReplay The client ‘SQL2K16-AG02’ is not a registered distributed replay client. 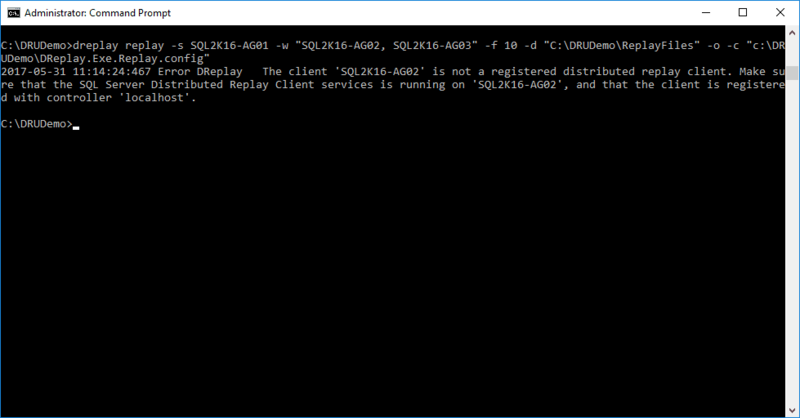 Make sure that the SQL Server Distributed Replay Client services is running on ‘SQL2K16-AG02’, and that the client is registered with controller ‘localhost’. 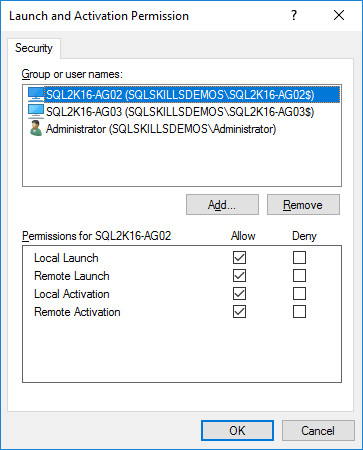 So this confirms that out-of-the-box 2016 DRU won’t work and permissions changes will be required to make it work properly. 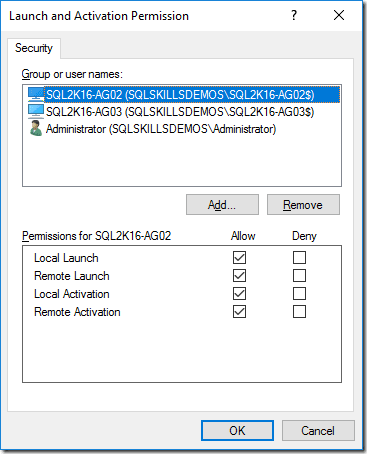 Edit the Launch and Activation Permissions and add the Service Account for the clients, in this case because a Service SID is being used, the computer account from Active Directory for each client machine, and allow Local Launch, Remote Launch, Local Activation and Remote Activation. 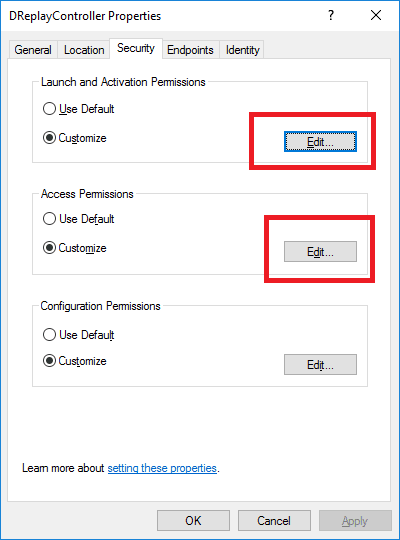 Then edit the Access permissions and set Local Access and Remote Access for the Service accounts again. 2017-05-31 11:20:27:454 OPERATIONAL [Client Service] Microsoft SQL Server Distributed Replay Client – 13.0.1601.5. 2017-05-31 11:20:27:454 OPERATIONAL [Client Service] © Microsoft Corporation. 2017-05-31 11:20:27:454 OPERATIONAL [Client Service] All rights reserved. 2017-05-31 11:20:27:454 OPERATIONAL [Client Service] Current edition is: [Enterprise Edition]. 2017-05-31 11:20:27:454 OPERATIONAL [Common] Initializing dump support. 2017-05-31 11:20:27:454 OPERATIONAL [Client Service] Windows service “Microsoft SQL Server Distributed Replay Client” has started under service account “NT SERVICE\SQL Server Distributed Replay Client”. Process ID is 6172. 2017-05-31 11:20:27:454 OPERATIONAL [Client Service] Time Zone: Eastern Standard Time. 2017-05-31 11:20:27:454 OPERATIONAL [Client Service] Controller name is “SQL2K16-AG01”. 2017-05-31 11:20:27:454 OPERATIONAL [Client Service] Working directory is “C:\Program Files (x86)\Microsoft SQL Server\130\Tools\DReplayClient\WorkingDir”. 2017-05-31 11:20:27:454 OPERATIONAL [Client Service] Result directory is “C:\Program Files (x86)\Microsoft SQL Server\130\Tools\DReplayClient\ResultDir”. 2017-05-31 11:21:21:798 OPERATIONAL [Client Service] Registered with controller “SQL2K16-AG01”. 2017-05-31 11:21:33:203 Error DReplay Unexpected error occurred! 2017-05-31 11:21:31:374 OPERATIONAL [Controller Service] Target DB Server: [SQL2K16-AG01]. 2017-05-31 11:21:31:374 OPERATIONAL [Controller Service] Controller Working Directory: [C:\DRUDemo\ReplayFiles]. 2017-05-31 11:21:31:374 OPERATIONAL [Controller Service] Generate Result Trace: [Yes]. 2017-05-31 11:21:31:374 OPERATIONAL [Controller Service] Sequencing Mode: [SYNC]. 2017-05-31 11:21:31:374 OPERATIONAL [Controller Service] Connect Time Scale: . 2017-05-31 11:21:31:374 OPERATIONAL [Controller Service] Think Time Scale: . 2017-05-31 11:21:31:374 OPERATIONAL [Controller Service] Healthmon Polling Interval: . 2017-05-31 11:21:31:374 OPERATIONAL [Controller Service] Query Timeout: . 2017-05-31 11:21:31:374 OPERATIONAL [Controller Service] Data Provider Type: [ODBC]. 2017-05-31 11:21:31:374 OPERATIONAL [Controller Service] Threads Per Client: . 2017-05-31 11:21:31:374 OPERATIONAL [Controller Service] Record Row Count: [Yes]. 2017-05-31 11:21:31:374 OPERATIONAL [Controller Service] Record Result Set: [No]. 2017-05-31 11:21:31:374 OPERATIONAL [Controller Service] Connection Pooling Enabled: [Yes]. 2017-05-31 11:21:31:374 OPERATIONAL [Controller Service] Stress Scale Granularity: [Connection]. 2017-05-31 11:21:31:374 OPERATIONAL [Controller Service] Replay Clients: [SQL2K16-AG02, SQL2K16-AG03]. 2017-05-31 11:21:33:203 OPERATIONAL [Controller Service] Event replay completed. 2017-05-31 11:21:33:203 OPERATIONAL [Controller Service] Elapsed time: 0 day(s), 0 hour(s), 0 minute(s), 1 second(s). 2017-05-31 11:21:33:189 CRITICAL [Client Service] Security violation with invalid remote caller. 2017-05-31 11:21:33:189 CRITICAL [Client Service] Caller auth level is 2. 2017-05-31 11:21:33:189 CRITICAL [Client Service] Caller impersonation level is 1. 2017-05-31 11:21:33:189 CRITICAL [Client Service] Caller identity is SQLSKILLSDEMOS\SQL2K16-AG01$. 2017-05-31 11:21:33:189 CRITICAL [Client Service] Controller account is NT SERVICE\SQL Server Distributed Replay Controller. So this points to another security issue, but I wasn’t sure how to go about troubleshooting this further using s Service SID, so at this point I changed from Service SIDs to Active Directory User accounts to run the services, DReplayClient for the clients and DReplayController for the controller. I reset all the permissions in Component Services on the controller machine and assigned the DReplayClient account to the Distributed COM Users group on the controller machine and gave it another shot. 2017-05-31 11:37:51:189 Info DReplay Dispatching in progress. 2017-05-31 11:37:51:189 Info DReplay 0 events have been dispatched. 2017-05-31 11:37:58:892 Info DReplay Dispatching has completed. 2017-05-31 11:37:58:892 Info DReplay 0 events dispatched in total. 2017-05-31 11:37:58:892 Info DReplay Elapsed time: 0 day(s), 0 hour(s), 0 minute(s), 0 second(s). 2017-05-31 11:37:58:892 Info DReplay Event replay in progress. 2017-05-31 11:37:58:892 Info DReplay Event replay has completed. 2017-05-31 11:37:58:892 Info DReplay 0 events (100 %) have been replayed in total. Pass rate 0.00 %. 2017-05-31 11:37:58:892 Info DReplay Elapsed time: 0 day(s), 0 hour(s), 0 minute(s), 9 second(s). 2017-05-31 11:37:58:892 Error DReplay Unexpected error occurred! 2017-05-31 11:35:56:985 OPERATIONAL [Controller Service] Target DB Server: [SQL2K16-AG01]. 2017-05-31 11:35:56:985 OPERATIONAL [Controller Service] Controller Working Directory: [C:\DRUDemo\ReplayFiles]. 2017-05-31 11:35:56:985 OPERATIONAL [Controller Service] Generate Result Trace: [Yes]. 2017-05-31 11:35:56:985 OPERATIONAL [Controller Service] Sequencing Mode: [SYNC]. 2017-05-31 11:35:56:985 OPERATIONAL [Controller Service] Connect Time Scale: . 2017-05-31 11:35:56:985 OPERATIONAL [Controller Service] Think Time Scale: . 2017-05-31 11:35:56:985 OPERATIONAL [Controller Service] Healthmon Polling Interval: . 2017-05-31 11:35:56:985 OPERATIONAL [Controller Service] Query Timeout: . 2017-05-31 11:35:56:985 OPERATIONAL [Controller Service] Data Provider Type: [ODBC]. 2017-05-31 11:35:56:985 OPERATIONAL [Controller Service] Threads Per Client: . 2017-05-31 11:35:56:985 OPERATIONAL [Controller Service] Record Row Count: [Yes]. 2017-05-31 11:35:56:985 OPERATIONAL [Controller Service] Record Result Set: [No]. 2017-05-31 11:35:56:985 OPERATIONAL [Controller Service] Connection Pooling Enabled: [Yes]. 2017-05-31 11:35:56:985 OPERATIONAL [Controller Service] Stress Scale Granularity: [Connection]. 2017-05-31 11:35:56:985 OPERATIONAL [Controller Service] Replay Clients: [SQL2K16-AG02, SQL2K16-AG03]. 2017-05-31 11:35:59:048 OPERATIONAL [Controller Service] Event dispatch in progress. 2017-05-31 11:36:05:766 OPERATIONAL [Controller Service] Event replay completed. 2017-05-31 11:36:05:766 OPERATIONAL [Controller Service] Elapsed time: 0 day(s), 0 hour(s), 0 minute(s), 8 second(s). Not much help there either, and this is where I would expect that most people would end up giving up because there is nothing really actionable here at all. 2017-05-31 11:45:14:376 Info DReplay Dispatching in progress. 2017-05-31 11:45:14:376 Info DReplay 0 events have been dispatched. 2017-05-31 11:45:24:377 Info DReplay 30753 events have been dispatched. 2017-05-31 11:45:34:377 Info DReplay 68262 events have been dispatched. 2017-05-31 11:45:44:377 Info DReplay 106677 events have been dispatched. 2017-05-31 11:45:54:393 Info DReplay 144226 events have been dispatched. 2017-05-31 11:46:04:408 Info DReplay 183595 events have been dispatched. 2017-05-31 11:46:14:424 Info DReplay 221378 events have been dispatched. 2017-05-31 11:46:24:424 Info DReplay 257754 events have been dispatched. 2017-05-31 11:46:34:455 Info DReplay 298436 events have been dispatched. 2017-05-31 11:46:44:471 Info DReplay 336026 events have been dispatched. 2017-05-31 11:46:54:471 Info DReplay 373717 events have been dispatched. 2017-05-31 11:47:04:486 Info DReplay 410378 events have been dispatched. 2017-05-31 11:47:14:502 Info DReplay 449949 events have been dispatched. 2017-05-31 11:47:24:518 Info DReplay 486431 events have been dispatched. 2017-05-31 11:47:34:533 Info DReplay 526228 events have been dispatched. 2017-05-31 11:47:44:549 Info DReplay 563484 events have been dispatched. 2017-05-31 11:47:48:361 Info DReplay Dispatching has completed. 2017-05-31 11:47:48:361 Info DReplay 573630 events dispatched in total. 2017-05-31 11:47:48:361 Info DReplay Elapsed time: 0 day(s), 0 hour(s), 2 minute(s), 35 second(s). 2017-05-31 11:47:48:361 Info DReplay Event replay in progress. 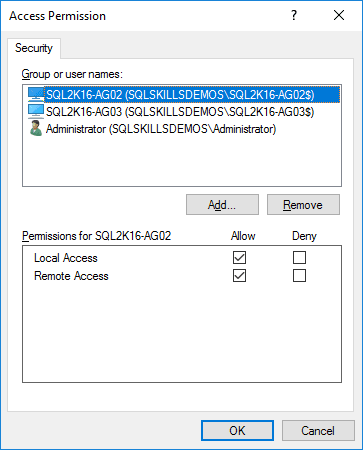 Permissions, permissions, permissions… While having some of the worst error messages imaginable, the problems with getting Distributed Replay in SQL Server 2016 configured have so far boiled down to permissions issues and ensuring that the permissions for the service accounts are set correctly on the Controller machine, and on the Target Server for the replay operation should resolve the issues. 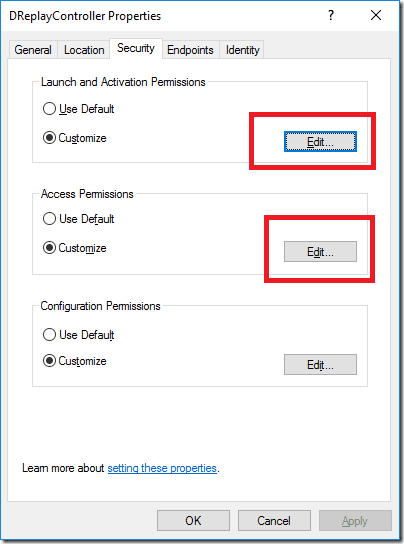 Don’t forget to configure Firewall rules to allow access to the network appropriately as described in the original 2012 DRU post I wrote a few years back. Hopefully this post will save someone the trouble of trying to figure this all out blindly. I recently did some drive upgrades in my personal laptops and as a result I had a couple of SSD drives sitting around that I wanted to make use of. A few weeks ago I purchased a new OCZ Agility 3 240GB SATA III SSD from Newegg when it was on sale and at the same time I also purchased two MassCool USB 3 external enclosures to make use of the two 120GB OCZ Vertex 2 SSD’s that I would have sitting around. The cost for the MassCool enclosures was only $14.99 so I figured it would be a good way to reuse the SSD’s at the time. When the package from Newegg arrived, I immediately installed the SSD into one of my personal machines and then later I went about testing the performance of the USB 3 external enclosures with the older SSD’s. Initially the performance was impressive, and I posted a few tweets that attracted some attention and a few people requested that I blog my results. To make this blog post something worth looking at, I ran a number of additional tests over the last few days using SQLIO and a varying configuration of drives with external enclosures. Specifically I tested two different USB 3 2.5” SATA enclosures, a separate eSATA 2.5” SATA external enclosure, as well as two USB 3 HDD’s that I already owned to get some performance information from each of the setups. At the time that I bought the 120GB drive I paid close to $2.42 per megabyte for it, and at the time this was a good deal. When I purchased the 240GB SSD I paid right around $1.08 per megabyte, showing how much the prices have decreased nearly 3 years later. I happen to own a number of OCZ drives at home and they are one of my favorite brands personally because of the overall reliability I’ve had with them the last three years as well as the performance to cost ratio I’ve experienced. Initially I was just testing the MassCool USB 3 enclosures that I purchased, and I was incredibly happy with the performance that I had from them. However, after tweeting about the results, my friend Jose Chinchilla (Blog | Twitter) mentioned that I should also try out eSATA because it performed significantly better in his own tests. Based on this tweet, I set out to my local MicroCenter computer store to purchase a eSATA enclosure and while I was buying it, one of the sales representatives, a guy named Chris, approached me and asked what I was planning to do with the enclosure because USB 3.0 should be faster for SSD’s. The numbers he quoted didn’t match my previous testing, so he made a recommendation for a specific USB 3.0 enclosure, and I figured, for $20 it was worth testing, so I bought an extra Hornettek Panther USB 3.0 device for comparison testing along with the Vantec NexStar CX eSATA enclosure I had already selected. The two external USB 3.0 HDD drives had very similar performance characteristics, and they beat their USB 2.0 counterparts performance wise significantly. I’ve been incredibly happy with my USB 3.0 HDDs overall for the last few years and I only purchase USB 3.0 HDD drives based on my performance tests a few years ago. However, when compared with the USB 3.0 external enclosures with the SSD’s, the performance difference is quite significant. One of the problems I’ve had lately is being able to fit all of the virtual machine hard drives, VHD’s for Hyper-V when using my dual boot Hyper-V host VHD, as well as my original VMware Workstation VMDK’s for classes, and even the VirtualBox virtual disk images (VDI) from my blog series on building a completely free playground. Using the SSD’s with USB 3.0 definitely makes storing my virtual hard disk files on an external array much more feasible performance wise, and my only real limitation from testing is the size of the external device. However, the performance of the eSATA external enclosure is incredibly better, with the side trade off that I can only have 1 of them attached to my laptops at a time, and for my personal laptop, the fact that the eSATA enclosure requires not only the eSATA port for throughput, but also the additional USB 2.0 port for power really limits what I can do as far as having multiple disks connected to the laptop. To be honest, this is something that I can live with given that I also have swapped out my CD/DVD ROM bay for a replacement New Mode US second HDD conversion. This means that I can have two 240GB OCZ SSD’s in my E5420, which is a similar configuration to the dual 256GB Dell SSD configuration in my Precision M6500 for work, while being able to move VM images between the two machines using my older 120GB SSD’s with fantastic performance. If you are looking at really high performance external hard disk configurations for scalability, I would highly recommend looking at either eSATA with an extra SSD drive or if you need multiple devices and you have USB 3.0, consider going that route. Either will outperform your existing options significantly. For the time being, I am going to stick with one eSATA device, which is compatible with both of my laptops, and one USB 3.0 device, which only works with my M6500 at USB 3.0 speeds. My E5420 only has USB 2.0 onboard, so it makes more sense for me to stick with eSATA for the main shared drive. 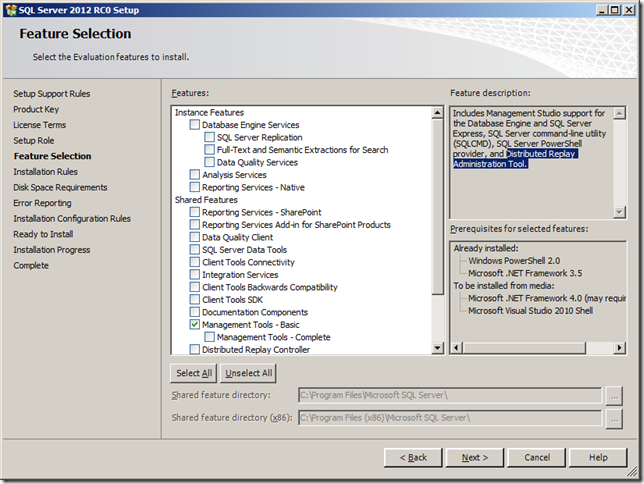 In the first post in this blog series on using SQL Server 2012 Distributed Replay, Installing and Configuring SQL Server 2012 Distributed Replay, we looked at how to configure a Distributed Replay environment using multiple clients and a dedicated replay controller. In this post we’ll actually make use of the previously configured servers to perform a distributed replay using a random workload that has been generated against the AdventureWorks2008R2 database installed on our Replay SQL Server. For the purposes of generating a random workload against AdventureWorks2008R2, I created a workload generator that can be found on my blog post The AdventureWorks2008R2 Books Online Random Workload Generator. I used this with 2 different PowerShell Windows from SQL2012-DRU1 and SQL2012-DRU2 to run a random workload across multiple sessions against the SQL2012-DB1 server. 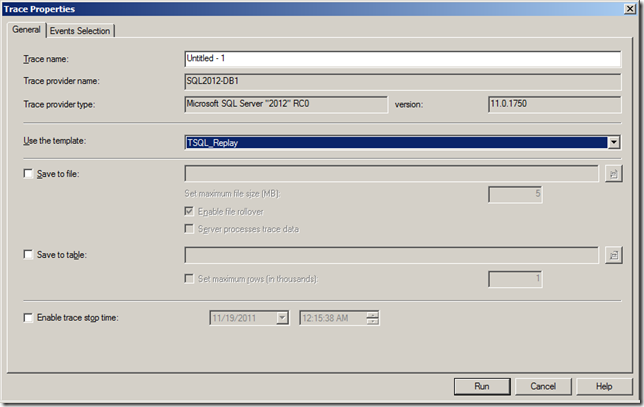 To capture the trace data required for performing the replay, SQL Server Profiler was used along with the TSQL_Replay template to create the capture. For production systems, the best way to go about capturing a Replay Trace is to script the trace definition to a file, and then create the trace as a server side trace that is writing to a trace file on local disks for the server. This has a significantly lower impact that tracing directly from Profiler, which uses the rowset provider for Trace. 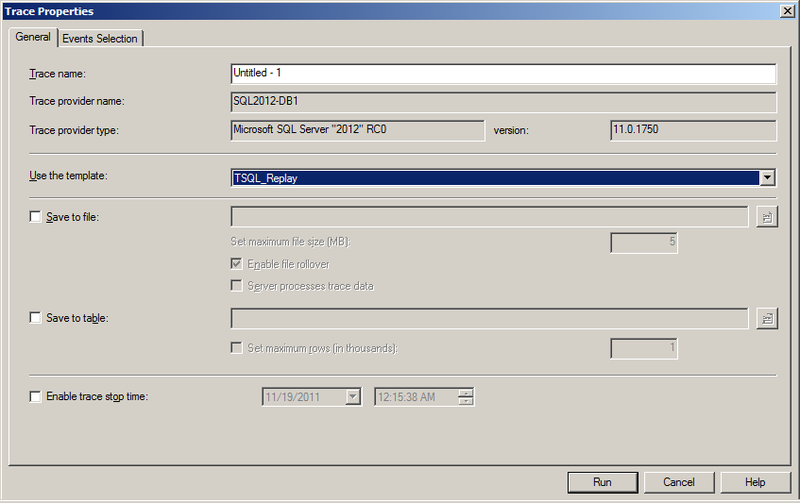 With the replay trace running, and the workload generating events I waited for the trace to collect around 80000 rows of data and then shutdown the trace so that I could access the trace file to copy it from the SQL2012-DB1 server to the SQL2012-DRU server where the Distributed Replay Controller is installed. At the point that I went to perform the preprocessing of the trace file for replay, I realized a difference in my environment using multiple servers to build this blog series versus my original setup using a single server for learning how to use Distributed Replay. In order to preprocess the trace file for replay, you have to have the Management Tools Basic installed on the server that will be used for preprocessing the trace data. 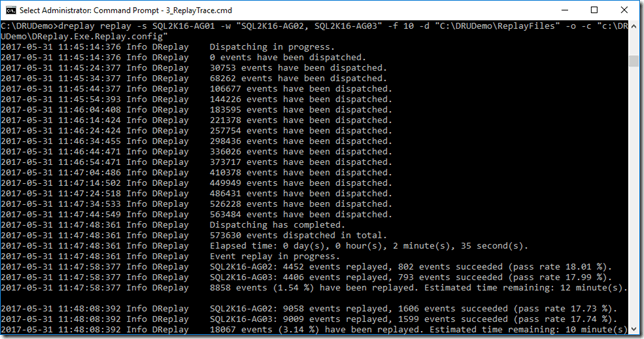 If you have been following this blog series to learn how to use Distributed Replay, you will need to run Setup on the SQL2012-DRU server to add this feature before it can be used for pre-processing the trace file. This is necessary to administer Distributed Replay. 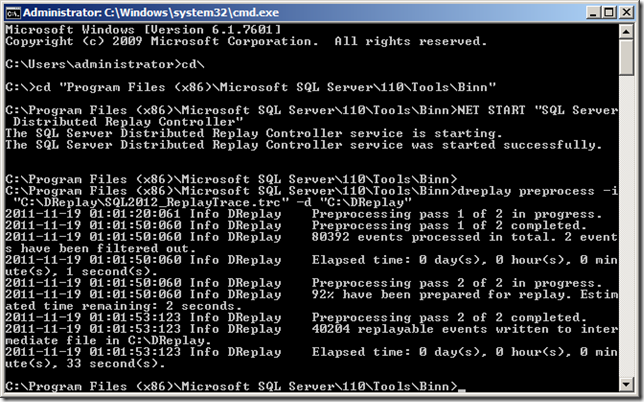 C:\Program Files (x86)\Microsoft SQL Server\110\Tools\Binn>dreplay -? 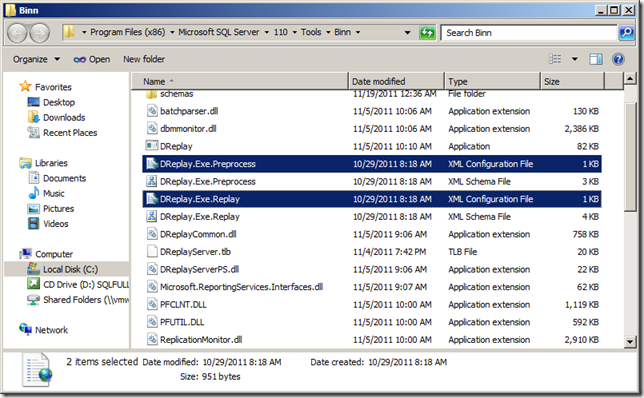 preprocess Apply filters and prepare trace data for intermediate file on controller. replay Transfer the dispatch files to the clients, launch and synchronize replay. status Query and display the current status of the controller. cancel Cancel the current operation on the controller. -? Display the command syntax summary. Run dreplay <verb> -? for detailed help on each verb. To perform the preprocessing, you will need to do a couple of different steps. The first thing you need to do is edit any options that you want to set for the pre-processing by editing the DReplay.Exe.Preproces.config file in the C:\Program Files (x86)\Microsoft SQL Server\110\Tools\Binn path on the server. There are two configuration files for DReplay.Exe as highlighted below. At this time make sure that you are only editing the Preprocess.config file. The DReplay.Exe.Preproces.config file contains a schema defined XML document that controls the configuration of the preprocessing. In general the options set for preprocessing should not need to be changed but if you want to include system sessions as a part of the replay, you can change the options in the XML, which is listed below. 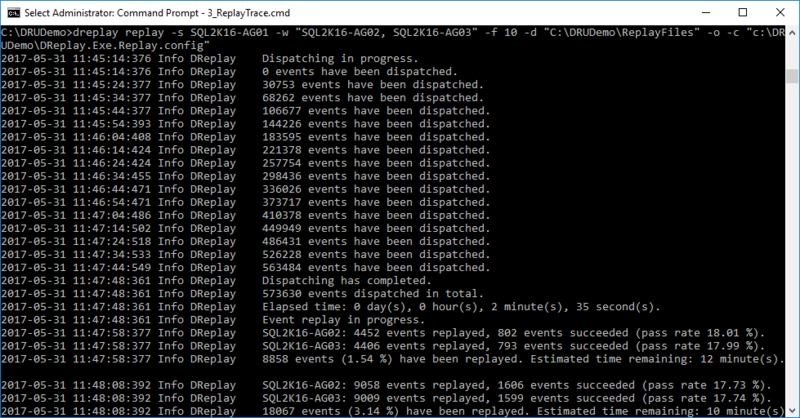 dreplay preprocess -i "C:\DReplay\SQL2012_ReplayTrace.trc" -d "C:\DReplay"
This will process the trace file and output the working files for performing the Distributed Replay to the C:\DReplay path. Below is a screenshot of the full window for preprocessing the trace file. Note: The dreplay executable can be called from any path within the server because the Binn path is a part of the Path Environmental variables. However, the executable has to be called from within the Binn folder to access the necessary .config files and .xsd schema files for the configuration. If you want to be able to run this executable from another location on the server, you will need to copy the .config and .xsd files out of the Binn folder to the folder that you want to be able to run dreplay within for it to work. 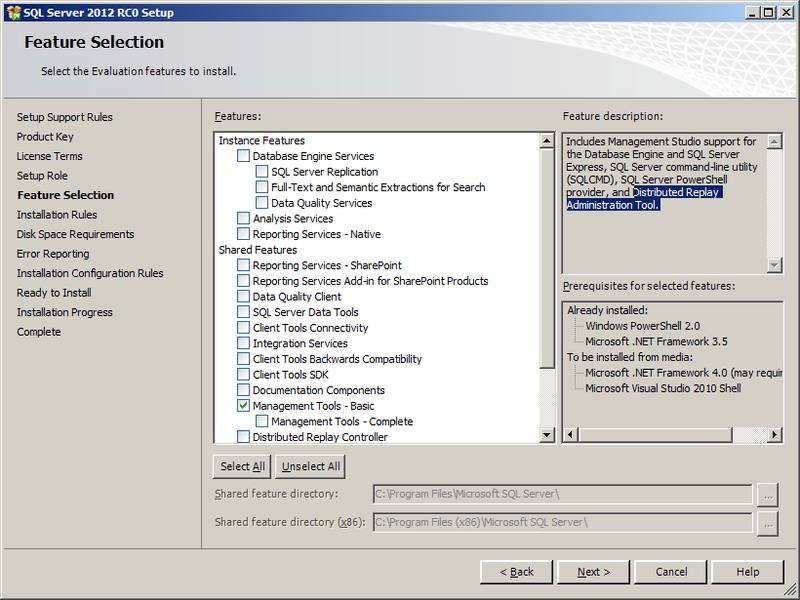 The first step in performing the replay is to start the “SQL Server Distributed Replay Client” service on each of the replay clients using NET START. 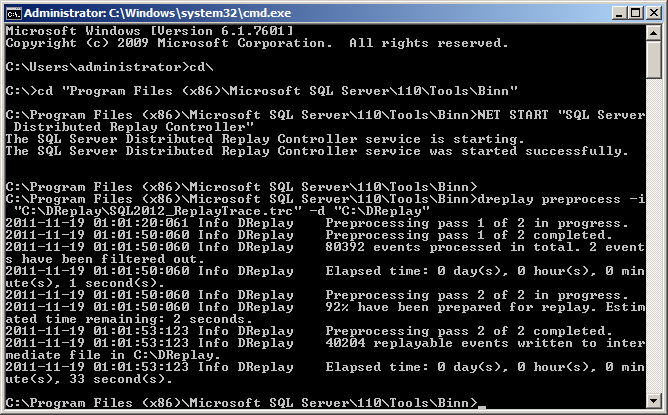 NET START "SQL Server Distributed Replay Client"
You will want to verify that each of the clients was able to successfully connect to the controller in the logs as shown in the previous post in this series. Once this has been done, your environment is almost ready for replay. For the purposes of this blog series, a SELECT only workload has been generated for replay against AdventureWorks2008R2. However, in most environments you won’t have a SELECT only workload, so you will have to plan for and prepare your replay environment using a BACKUP/RESTORE of the production database from a point within the captured workload so that the database can be replayed against without having problems associated with Primary Key constraint violations during the replay. 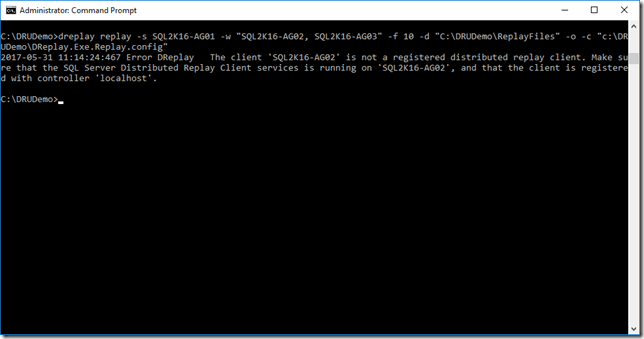 dreplay replay -s "SQL2012-DB1" -d "C:\DReplay" -w "SQL2012-DRU1, SQL2012-DRU2"
Once this is executed, the Distributed Replay Controller will take read in the preprocessed replay file, and then synchronize the replay across all of the clients specified with the –w command line parameter. While the replay operation occurs, the command window for the controller will output periodic updates about the current status of the replay process. The frequency of the status updates can be controlled using the –f command line switch to specify the number of seconds between each of the updates. Each of the status updates will provide information about each of the clients including the total number of events that have been replayed, the success rate of the replay operations per client, as well as an estimate for the total amount of time remaining to complete the replay operation. When the replay completes the total elapsed time and pass rate for the events is output. In the next and final post in this series, we’ll look at some of the common problems with using Distributed Replay and how to resolve them, including manually configuring the Controller and add additional Client Service accounts to the environment after Setup has been completed.